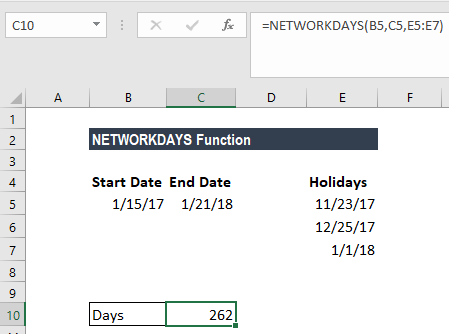 The NETWORKDAYS Function calculates the number of workdays between two dates in Excel. When using the function, the number of weekends are automatically excluded. It also allows you to skip specified holidays and only count business days. It is categorized in Excel as a Date/Time FunctionFunctionsList of the most important Excel functions for financial analysts. This cheat sheet covers 100s of functions that are critical to know as an Excel analyst. You can use this formula to calculate working days in Excel between two dates. In financeFinanceCFI's Finance Articles are designed as self-study guides to learn important finance concepts online at your own pace. Browse hundreds of finance articles and guides to learn about the cost of capital, financial analysis, ratios, multiples, rates of return, profitability metics, and how to evaluate the overall and accounting, the net workdays function is useful in calculating employee benefits that accrued based on days worked, the number of working days available during a project, or the number of business days required to resolve a ticket raised by a customer, etc. Start_date (required argument) – Start_date can either be earlier than end_date, later than end_date, or same as end_date. End_date (required argument) – It is the end date. How to calculate working days in Excel? 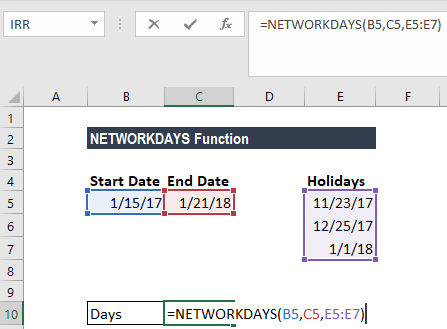 Let’s see a few examples to understand how the NETWORKDAYS function to calculate working days in Excel. Using the formula above, we will get the number of working days as 262, as shown below. The NETWORKDAYS function will include both the start date and end date when calculating work days. So, if we give NETWORKDAYS the same date for start date and end date, it will return 1. #VALUE! error – Occurs when any of the given argument is not a valid date. If we wish to use weekends other than Saturday and Sunday, we need to use the NETWORKDAYS.INTL function.